When you travel with small kids, you will most probably have a lot of luggage. Whenever we leave Dubai for our annual leave in summer, I am glad to travel with Emirates Airlines, as they allow 30kgs luggage per person. We often needed that. As the kids get older, the luggage gets less/lighter. You don't need a big toy bag anymore (only a small one), or 7 sets of clothes to change which can easily be soiled by a baby or toddler in 24 hours. Now that my kids are 4 and almost 7 years old, we have more space for newly-bought things to bring back to Dubai: things that are cheaper in Europe, or are simply not available in Dubai. Or sometimes, because it's more fun buying things when you are on holiday. From my previous post you may know that we also had several kilos of dried salted codfish and German smoked ham in our luggage. This year's purchases also included: coconut flour, new trainers (Saucony Kinvara), German books, vanilla extract, and an ice cream maker!! My family loves ice cream and especially sorbet. The summer temperatures in Dubai justify any amount of ice cream eaten on any day.We have been looking around for ice cream makers in Dubai. Given the hot temperatures and long summer in Dubai, common sense would make you think that they would be a huge variety to chose from. In real life, it's the opposite. After checking several shops, I found exactly one (!) ice cream maker. And guess what: it was the most expensive one that you can get. While on holidays in Germany, I did some ice cream maker research, and finally ordered one on Amazon. The rather bulky box had to be squeezed into our luggage, but I managed. And never regretted. For the past two weeks I've been making sorbets and frozen yogurts almost on a daily basis. Always small-ish amounts, as I have a hundred flavor ideas in my head that need to be tried and tested. 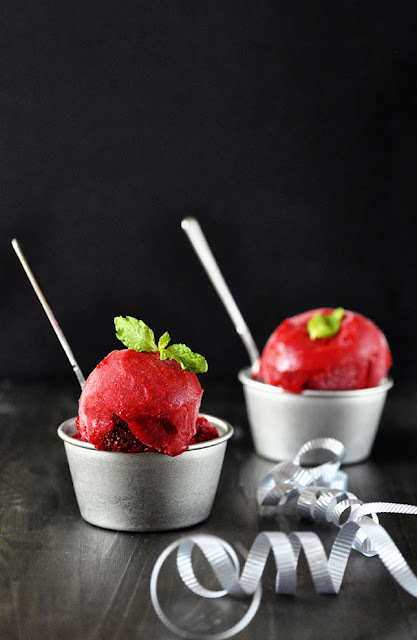 One of the first sorbet flavors that had to be tried had to be raspberry, as this was the store-bought one that my husband loved the most. I wanted to come up with something identical in flavor but without all the additives. With raspberries, it was one of the easiest tasks. I have made several batches with frozen raspberries. All it needs is a sweetener: now it is up to you to choose between honey, maple or agave syrup. It is as simple as that: puree the raspberries, sweeten to taste and put into ice cream maker. Done! You'll get the most refreshing dessert, made of raw fruit with all its vitamins and minerals. I think only eating fresh raspberries straight from the bush is healthier than this. Enjoy! If you use frozen raspberries, you may get sorbet immediately. Serve immediately or transfer to container and keep in the freezer. If using fresh or thawed raspberries, pour mixture into ice cream maker, and follow ice cream maker's instructions. Serve immediately or transfer to container and keep in freezer.